Dr. Wharton graduated from Long Island University in 2007 with a degree in Interdisciplinary Psychology & Biology. She went on to pursue her veterinary degree at the Ontario Veterinary College. When she returned to the states, she completed a rotating internship in small animal medicine and surgery at the Veterinary Medical Center of Long Island. Dr. Wharton not only enjoys emergency medicine, but also has an interest in Veterinary Behavior. 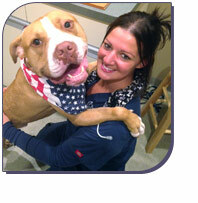 In her spare time, she enjoys country music, hiking, biking, and agility with her rescued pit bull Mace.